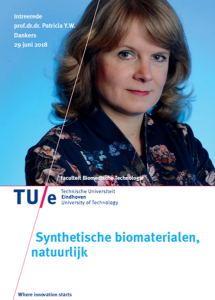 On Friday June 29, prof. Patricia Dankers (TU/e) delivered her inaugural lecture entitled ‘Synthetische biomaterialen, natuurlijk!‘. Patricia Dankers is inspired by the complexity of natural materials that capture cells and aims to create synthetic materials that are able to execute new functions at different time- and length scales. In order to make such materials, design criteria to introduce complexity as found in nature need to be met. However, in order to translate these materials towards clinical applications, simplicity is key. In her research, prof. Patricia Dankers aims to balance between complexity and simplicity, all based on control on the chemical level. She envisions synthetic molecular materials will contribute heavily in biomedical applications. More details can be found here.